While ferrets are not for everyone, they can make great pets for the right owner. They are affectionate and bond with their owners, quiet for a large part of the day, and there are few pets as playful as ferrets. However, they seem to have garnered a negative image which is largely undeserved. If you are considering a ferret, learn more about how ferrets make good pets! With mischievous eyes and sweet faces, ferrets are undeniably adorable. They are a small size and can provide your family with a sweet long-term pet. Most ferrets live for about six to eight years, though some pet ferrets can live up to 12 years. Females ferrets usually grow to 13 to 14 inches long and weigh anywhere from three-quarters of a pound to two and a half pounds. Male ferrets are often slightly larger. They typically grow to 15 to 16 inches long and weigh two to three and a half pounds if neutered. They can grow larger (four or more pounds) if they are not neutered. They will entertain you endlessly with their antics and will happily play with ferret toys. Watching ferrets play for the sheer joy of it is guaranteed to lift your mood. Owning pets has proven health benefits for the owner because of the joy and affection they bring. It is often recommended (though not essential) to have more than one pet ferret. Having two or more ferrets increases the fun factor for the owner and the ferrets as they will interact and play together, sometimes with wild abandon. Despite having other ferrets to socialize with, they will still crave attention from their owners. Some owners are amazed at how adept ferrets become at solving problems. Ferrets are very determined and will work at figuring something out with surprising persistence. They enjoy challenging puzzles and games and it's recommended to provide them with puzzle-based toys or games. While they can and do vocalize, for the most part, ferrets are very quiet. The most noise they will make is if they are very frightened or injured. They also sleep away a large portion of the day. Ferrets don't need a huge cage, though the bigger the better. Ideal ferret cages are tall with multiple levels, so they still don't take up too much room. They do need to spend time out of their cage every day for playtime and exercise. This is especially true now that a variety of good quality ferret foods have become more widely available. Pre-made ferret food is available in most pet stores or online retailers. While you can offer them a variety of foods, it's helpful to use a high-quality pet food as the base to ensure proper nutrition. Ferrets can be trained to go in a box, though not to the same extent as cats and there are bound to be a few accidents. Most ferrets can be fairly reliably trained to use a litter box in and out of their cages. This is a big plus when you have them out for exercise for a couple of hours a day! They can get all the exercise they need tearing around your (ferret-proofed) home! With a ferret-sized harness and a little training, you can take them out for a stroll. Few things will start a conversation with strangers faster than walking your ferret in the park! 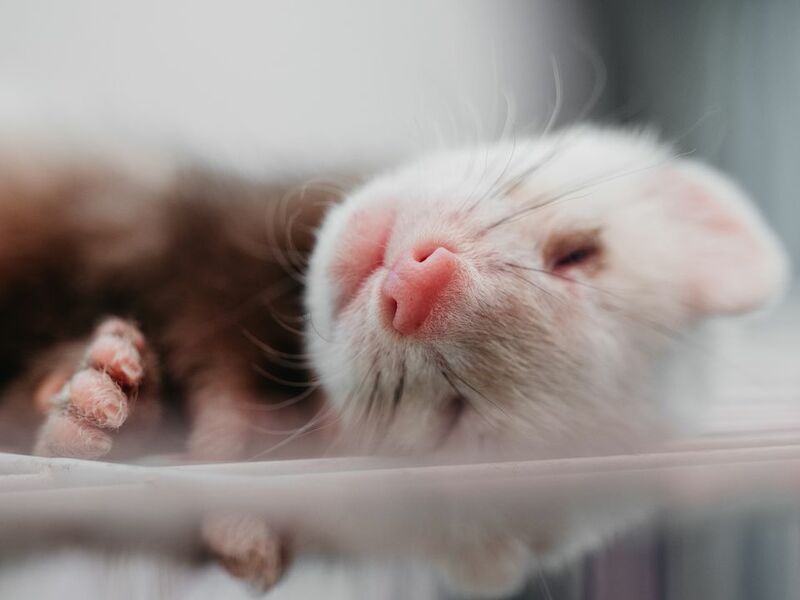 Every ferret is unique and has its own personality. Some are independent and some are very cuddly, but each is an individual! If you are thinking about having a pet ferret, it can be helpful to meet a few pet ferrets first. You'll see how their personalities will vary and give you a good sense of what it means to be a ferret owner.